Escape boredom. Fly into adventure! Gain a new perspective at Lake Erie Canopy Tours! 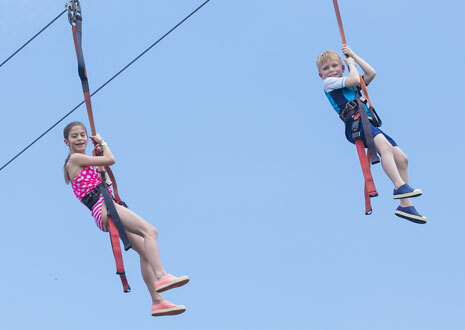 As the newest aerial adventure park in Northeast Ohio, located at The Lodge at Geneva-on-the-Lake, Lake Erie Canopy Tours is the largest aerial attraction east of Cleveland. Add a little extra zip to your next ziplining experience with three ways to play. Choose from a Zipline Canopy Tour with a guided, awe-inspiring excursion suspended on a network of steel cables and sky bridges anchored by towers spanning up to 60 feet high through the treetops. Guests get a bird’s eye view while flying at speeds up to 30 mph above sparkling creeks and Geneva State Park along Lake Erie’s shore. Or strap in and test your skills on the self-guided Adventure Courses, one for adults and another tyke-sized version for kids ages 4 to 10. The Adventure Courses feature circuits with over 30 ropes challenges to climb up, over, through and across, ranging in levels from easy to extreme. The continuous belay system keeps guests clipped in for safety as you discover new skills and thrills high above the ground. Let your imagination soar as you get up and zip out! Lake Erie Canopy Tours at The Lodge has your next adventure waiting… are you up for the challenge? Get your heart racing on this exhilarating 2.5 hour guided zipline tour, including swinging sky bridges, a side-by-side double zip and stunning views of Geneva State Park and Lake Erie. Challenge yourself on the self-guided ropes course featuring over 30 obstacles. With levels from easy to extreme, the adventure courses are great for group excursions, team building and thrilling birthday parties. Inspire kids to explore their sense of adventure on this new playground in the trees including short zips and cool ropes activities. Perfect motivation for them to stow the screens, let loose and get moving. COMING SOON! This summer, experience Geneva State Park from the calm waters of Cowles Creek with a boat rental from Lake Erie Canopy Tours. *Not yet available for booking. Looking for an exciting birthday idea? Perfect for kids and adults alike, enjoy climbing through trees and zipping through the air while having a party your guests won't forget! FIND IT ALL AT THE LODGE AT GENEVA-ON-THE-LAKE! After enjoying the Lake Erie Canopy Tours aerial park at The Lodge, be sure to complete your escape to Ohio’s Wine Country. Check out all the ways you can Stay, Play, Dine and simply relax on Lake Erie’s shore. The Lodge is your gateway to adventure. Apply Now to join our exciting team of Lake Erie Canopy tour guides! Become a team member today! Plan your Lake Erie Canopy Tours day trip today. Discover a new lake front experience with the Cottages at The Lodge. Cottages are located east of the outdoor pool, feature two bedrooms and more. Book now for your unforgettable Lake Erie getaway.